Is ‘The Mule’ Clint Eastwood’s Eleventh-Hour Oscar Play? Stephen Galloway, The Hollywood Reporter про «оскарівські» перспективи «Наркокур’єра» Клінта Іствуда. In 2004, the actor-director upended awards season with the late arrival of best picture winner ‘Million Dollar Baby.’ Now the 88-year-old has just dropped another strong drama, but history likely won’t repeat itself. At the beginning of the 2004 awards season, pundits were confidently locking in their predictions for the 77th Academy Awards. Ray, Taylor Hackford’s biography of Ray Charles, looked like a strong contender, fueled by a riveting central performance from Jamie Foxx. Martin Scorsese’s The Aviator, starring Leonardo DiCaprio as the elusive Howard Hughes, also appeared to be a frontrunner, not least because Scorsese had yet to win an Oscar. Then there were Alexander Payne’s charming road trip, Sideways, Michael Mann’s Collateral, Terry George’s Hotel Rwanda and Marc Forster’s Finding Neverland. But only one picture of any significance was ignored by almost everyone. It told the story of a young woman who enlists the aid of a veteran trainer to become a champion boxer. Insiders — none of whom had seen the movie — were skeptical. What on earth would possess a major studio to finance a gender-reversed Rocky? Who’d want to see Hilary Swank slugging a punching bag, five long years after she’d won the Oscar for Boys Don’t Cry? And why, oh why, would Clint Eastwood, whose best work was primarily in the Western and action genres, think he had any idea how to make a boxing drama, especially in the post-Raging Bull era? When Warner Bros. announced in mid-September that it would give Million Dollar Baby an Oscar-qualifying run in December, it did nothing to dispel the skepticism, which only began to lift when a group of critics were shown the picture Nov. 19. Three days later, the movie’s awards trajectory got liftoff at an enthusiastic Directors Guild screening. Overnight, everything changed. The National Board of Review proclaimed Baby best film. It screened in time to collect Globe and SAG noms. And three months later, it landed a knockout blow at the 2005 Academy Awards, earning best actress (Swank), best supporting actor (Morgan Freeman), and two Oscars for Eastwood: best director and best picture. Fourteen years later, the filmmaker is back with another late-entry contender, The Mule. A comedy-drama based on the real-life tale of a retiree who stumbles into work trafficking drugs, the movie has little by way of plot and even less by way of action. And yet it has been embraced by critics (with the one or two exceptions bothered by the feature’s portrayal of some of its Mexican characters) and moviegoers, who powered the film to a $17.2 million opening over the weekend to land one of the biggest bows ever for a film helmed by Eastwood, largely on the strength of older audiences. Stripped of artifice, laid bare of pyrotechnics, Mule throws down a gauntlet before modern-day audiences, as if to say: You’ll find more genuine interest in this wizened man’s face than in the fireworks of any franchise film. The picture belongs to a late, great phase of Eastwood’s career in which he has largely turned his back on the gun-toting, dialogue-withholding man of action of his past. Features such as Mystic River (2003), Million Dollar Baby (2004), Letters From Iwo Jima (2006), American Sniper (2014) and Sully (2016) might not quite add up to a repudiation of his earlier work, but they show a distinct shift toward a mellower, more meditative philosophy. Events are reduced to a minimum, camera movement is limited to the essentials and character is defined not with a fusillade of gunfire but with the flicker of a smile. Will that be enough to win over the Academy and trigger another upset? Another great star’s return, Robert Redford’s The Old Man & the Gun, took the opposite release strategy, debuting at Telluride. But after a September opening, it faded at the box office, where it’s collected $11 million domestically. And although Redford scored a Globes nom for best actor in a comedy, it has lost awards momentum. True, Old Man is a far lesser film than Eastwood’s. But times have changed since Million Dollar Baby’s come-from-behind victory. An Oscar race that was once somewhat improvised has become as mechanized as any election. And Warners chose not to enter The Mule in this year’s early sweepstakes. No screeners were sent to SAG voters (whose deadlines now take place about a month earlier than they did in 2004). While the film was unveiled to the Hollywood Foreign Press Association (and failed to pick up any Globe noms), it was not shown to other groups that have traditionally been friendly to Eastwood, like the NBR. When queried about the silence, studio insiders insisted they considered the movie, which opened Dec. 14, a commercial effort rather than an awards play. This late entry may have arrived with unexpected critical success, at a time when the studio’s awards operation was moving full-steam-ahead with A Star Is Born. Or maybe the problem is simply Eastwood’s own reluctance to campaign at this stage in his career. 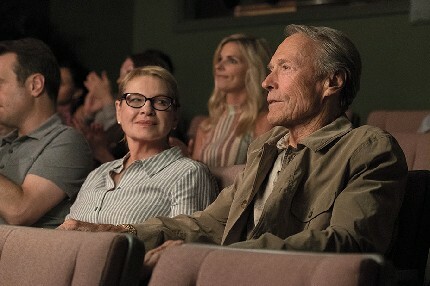 If so, it may be too late for his film to make up lost ground — even in the lead actor category, for Eastwood’s most modest and unmannered performance in decades. And that’s a shame. This is an art that hides the art, a craftsmanship so seamless, one doesn’t notice the craft at all. Mule swirls around the glass like a fine wine, its savor lingering long after the vintage has been consumed, all the better for not being uncorked too soon.